Surabh has been in the US for the past decade and half, while his parents back home in Hyderabad have aged beyond the stage where they can look after themselves. Despite repeated pleas by Saurabh, his parents are unwilling to leave their ancestral home in Hyderabad to join him in the US. This presents a problem typical to many NRIs who have left behind elderly parents in India. While leaving a prosperous career abroad to return back may not be a pragmatic solution one cannot ignore the responsibility of ensuring adequate care for the parents. Saurabh took wise step and hired GigBee who is taking care of his parent. What GigBee NRI Parent Care Service can do for your Parent? Daily/ Weekly visits by GigBee Team as per requirements. Arrangement of nurses for special requirements. Organizing transfer of money, handling of letters and other couriered items and catering to daily household requirements. Organizing functions to celebrate festivals and occasions with the elderly. Establishing and ensuring a regular communication between the NRIs and their parents either through telephone or video chatting via the internet. Provide detailed feedback and reports on the health and other issues of the elderly to their children abroad. Payment of bills, taxes and other recurring expenses. Collection of rents and depositing the same in the designated accounts. Arrangement of security for the elderly residing in their own house. GigBee team will be delighted to serve your parent, send us customize need and get the best price for our services. To know more about our services, please speak to our customer care officer @ +91-8790102190 or write us @ info@gigbee.in. We are all contributing to society in some way or the other but these are the people who deserve our gratitude but we have been too busy in filling the void of our empty lives that we choose to ignore the tremendous service they are doing for the society. Not all of us can relish the cholesterol and fat infested food served by the self-proclaimed inexpensive fast food joints that burn a deep hole in our pockets and hearts(literally), enter the saviors with their ‘Amritsari Naans’ and ‘Chole Kulcheys’, feeding the common man since don’t know when. We express our heartiest gratitude. Carrying the country’s baggage is an arduous task to take care of, you can observe these thin figurines carrying shitload of luggage on their heads and compensated with scorn and inadequate earnings. As you leave your humble abode and step out on the streets , did you ever notice or felt that you owe heaps of gratitude to someone who has glorified your morning by ridding you of the stench that sprawled your neighborhood and streets. Yes, that man/woman with the broom, humming folklore in bereft tones is the person you should thank for doing what he/she does. You owe your good night sleep to this guy, patrolling the streets while you’re snoring away comfortably in your beds, he’s the unsung hero, protector of the night and has probably saved you from multiple savage attacks. Think about it and thank him the next time you see your watchman. It’s pretty ironic that how sad the life of a joker is , while all they try to do is to spread smiles while life is strangulating their joys. We’re all pretty much aware of their condition, the least we can do is to be thankful for being there and taking up the responsibility to make the world a happier place. With inadequate pay and adequate public humiliation they serve you with an ever-present smile on their face , they are treated as social pariahs by the society(us) . Thank you Sirs! You’re doing a commendable job. Let the dads in your life know how much you care this Father’s Day. 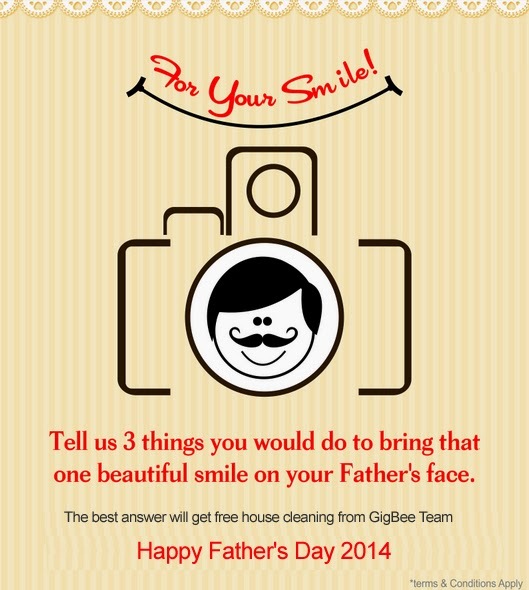 You already know you can hire a GigBee to deliver just about anything — from a bottle of something awesome to a shiny, new gadget — but tell us 3 things you would do to bring that one beautiful smile on your Father's face. The best answer will get free house cleaning from GigBee Team.